Posted on 12/14/2009, 10:26 pm, by sweets4ever, under Home Sweet Home. pinkpoodle230 found a creative method for reusing a mail-order product catalog. 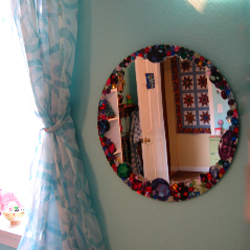 She cut out all of the colorful images and adhered them around the edge of a wall mirror. The result is simple, but adds a bit of fun flair to her room.